A quarry on the Lousberg which was first used in Neolithic times attests to the long occupation of the site of Aachen. No larger settlements, however, have been found to have existed in this remote rural area, distant at least 15 km from the nearest road even in Roman times, up to the early medieval period when the place is mentioned as a king's mansion for the first time, not long before Charlemagne became ruler of the Germanic Franks. Since Roman times, the hot springs at Aachen have been channeled into baths. 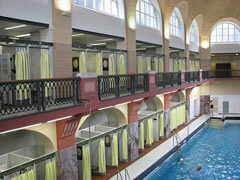 There are currently two places to "take the waters", at the Carolus Thermen complex and the bathhouse in Burtscheid. There is some documentary proof that the Romans named the hot sulfur springs of Aachen Aquis-Granum, and indeed to this day the city is known in Spanish as Aquisgrán and in Polish as Akwizgran. The name Granus has lately been identified as that of a Celtic deity. In French-speaking areas of the former Empire, the word aquis evolved into the modern Aix. After Roman times, Einhard mentions that in 765–6 Pippin the Younger spent both Christmas and Easter at Aquis villa ("Et celebravit natalem Domini in Aquis villa et pascha similiter. "), which must have been sufficiently equipped to support the royal household for several months. In the year of his coronation as King of Franks, 768, Charlemagne came to spend Christmas at Aachen for the first time. He went on to remain there in a mansion which he may have extended, although there is no source attesting any significant building activity at Aachen in his time apart from the building of the Palatine Chapel in Aachen (since 1929, cathedral) and the palatial presentation halls. 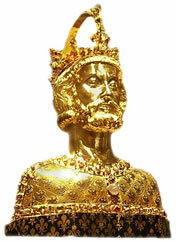 Charlemagne spent most winters between 792 and his death in 814 in Aachen, which became the focus of his court and the political center of his empire. 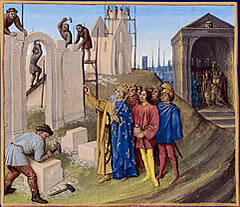 After his death, the king was buried in the church which he had built; his original tomb has been lost, while his alleged remains are preserved in the shrine where he was reburied after being declared a saint; his saintliness, however, was never very widely acknowledged outside the bishopric of Liège where he may still be venerated by tradition. 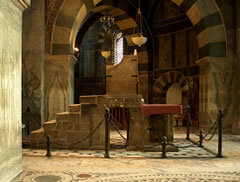 In 936, Otto I was crowned king of the kingdom in the collegiate church built by Charlemagne. Over the next 500 years, most kings of Germany destined to reign over the Holy Roman Empire were crowned "King of the Germans" in Aachen. The last king to be crowned here was Ferdinand I in 1531. During the Middle Ages, Aachen remained a city of regional importance, due to its proximity to Flanders, achieving a modest position in the trade in woollen cloths, favoured by imperial privilege. The city remained a Free Imperial City, subject to the Emperor only, but was politically far too weak to influence the policies of any of its neighbors. The only dominion it had was over Burtscheid, a neighboring territory ruled by a Benedictine abbess and forced to accept that all of its traffic must pass through the "Aachener Reich". Even in the late eighteenth century, the Abbess of Burtscheid was prevented from building a road linking her territory to the neighbouring estates of the duke of Jülich; the city of Aachen even deployed its handful of soldiers to chase away the road-diggers. From the early sixteenth century, Aachen lost power. A fire devastated the city in 1656. Aachen became attractive as a spa by the middle of the seventeenth century, not so much because of the effects of the hot springs on the health of its visitors but because Aachen was then — and remained well into the nineteenth century — a place of high-level prostitution in Europe. 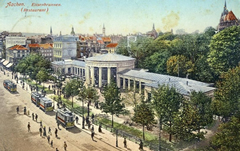 Traces of this hidden agenda of the city's history is found in the eighteenth century guidebooks to Aachen as well as to the other spas; the main indication for visiting patients, ironically, was syphilis; only by the end of the nineteenth century had rheuma become the most important object of cures at Aachen and Burtscheid. 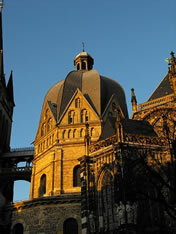 This explains why Aachen was chosen as site of several important congresses and peace treaties: the first congress of Aachen (often referred to as Congress of Aix-la-Chapelle in English) in 1668, leading to the First Treaty of Aachen in the same year which ended the War of Devolution. The second congress ended with the second treaty in 1748, finishing the War of the Austrian Succession. The third congress took place in 1818 to decide the fate of occupied Napoleonic France. By the middle of the nineteenth century, industrialization swept away most of the city's medieval rules of production and commerce, although the entirely corrupt remains of the city's mediæval constitution was kept in place (compare the famous remarks of Georg Forster in his Ansichten vom Niederrhein) until 1801, when Aachen became the "chef-lieu du département de la Roer" in Napoléon's First French Empire. In 1815 after the Napoleonic Wars, the Kingdom of Prussia took over and the city became one of its most socially and politically backward centres until the end of the nineteenth century. Administered within the Rhine Province, by 1880 the population was 80,000. Starting in 1840, the railway from Cologne to Belgium passed through Aachen. The city suffered extreme overcrowding and deplorable sanitary conditions up to 1875 when the mediæval fortifications were finally abandoned as a limit to building operations and new, less miserable quarters were built to the eastern part of the city where drainage of waste liquids was the easiest. In the nineteenth century and up to the 1930s, the city was important for the production of railway locomotives and carriages, iron, pins, needles, buttons, tobacco, woollen goods, and silk goods. Aachen was heavily damaged during World War II. It was taken by the Allies on 21 October 1944; the first German city to be captured. Aachen was destroyed partially — and in some parts completely — during the fighting, mostly by American artillery fire and demolitions by Waffen-SS defenders. Damaged buildings included the mediæval churches of St. Foillan, St. Paul and St. Nicholas, and the Rathaus (city hall), although the Aachen Cathedral was largely unscathed. Only 4,000 inhabitants remained in the city; the rest had followed evacuation orders. Its first Allied-appointed mayor, Franz Oppenhoff, was murdered by an SS commando unit. This text is based on the article Aachen from Wikipedia, The Free Encyclopedia. Retrieved on November 24, 2010. The text is licensed under the Creative Commons Attribution-Share-Alike License 3.0.